Bequeathed by Mr and Mrs Assheton-Bennett. This scene depicts a silent moment before a rude awakening, which will surely be noisy; the viewer is left to complete the story. The light flooding in from an upstairs room suggests that this is an early morning scene. A late-night reveller has succumbed to sleep after overindulging himself in the tavern. The dog and the broken pipe on the floor may imply that sexual encounters have taken place. Perhaps the trumpet alludes to the awakening of the dead on Judgement Day, when all will be accountable for their sins. Ochertvelt's tavern interiors of the 1660s and 1670s can be traced clearly to similar subjects by Van Mieris of the late 1650s. 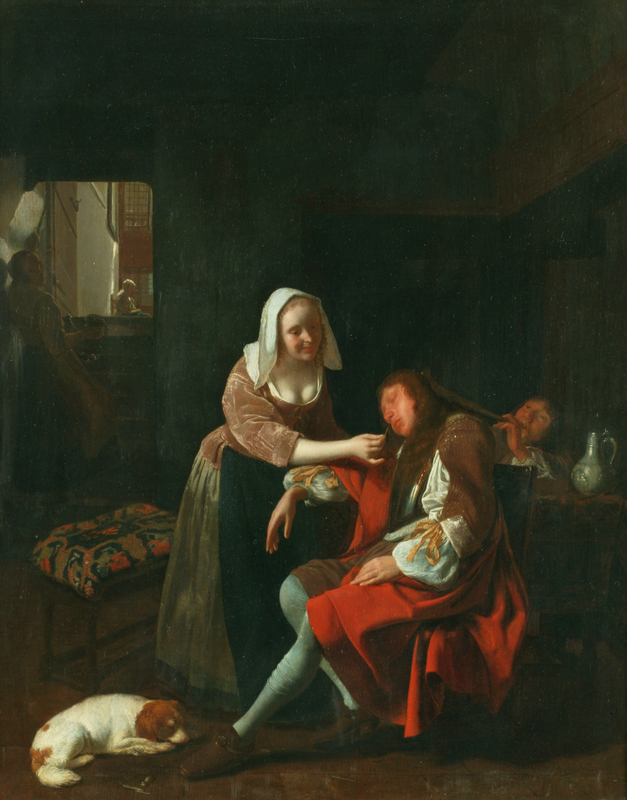 Similar figure types, costumes and disposition of the figures in the picture space are to be found in two other inn scenes in the collection of Manchester Art Galleries, The Embracing Cavalier and The Sleeping Cavalier.